We absolutely LOVE our Border Leicesters! Medium sized & calm personality – Small enough for a woman to work with, but large enough that lambs grow swiftly and mature into good sized meat animals at a young age. The ewes are quiet and friendly, the rams are calm and gentle. Strong boned legs – A good set of legs and feet to walk on, which many other breeds of sheep seem to be lacking for some reason. Hoof trimming is minimally needed. Conformation – Being dual purpose, breeders carefully monitor conformation for showing and meat purposes. As a spinner flock, the conformation benefits us by giving us a breed of sheep that is long-lived and functionally sound. Best udder conformation, tight attachment yet milky enough as yearlings to raise large, healthy twins! Mothering instinct, without being aggressive. I can comfortably work with a mother and her new lambs without feeling any threat from the mother. They do like to indignantly stomp their front feet if the dogs get too close to the lambing pen. Clean faced and clean legged – less work involved in shearing as you’re able to skip by the delicate areas of the head and legs! The long length of fiber provides flexibility – if we are shearing in cold weather, I can leave half an inch to an inch of wool on for protection of the pregnant ewes. One year of fiber growth in our flock is around 8 inches long. We sheared our ram as a lamb twice and got over 5″ fleeces each time. The fiber cards better than any other wool I’ve tried. Note: Long fiber and lustrous fiber may not be accepted at commercial carding mills. Be sure to call ahead before sending in BL wool for commercial processing! Our first ram and most excellent contribution to the genetics of our early flock – BIXBY – from Jonasson and Dancing Sheep Farm bloodlines. Bountiful, age one, with single ewe lamb Braaly – April 2016 (sire was the neighbor’s Shetland, since we only had one ram, Bixby, last season). Border Leicester wool is very clean (the length + luster seems to keep the fleece clean of most VM). I like to spin with the lanolin in, so wash and rinse fleeces at 90 degrees F just to remove some dirt and grime. Washed fleece can be processed through a drum carder. My hand crank carder is about 9″ x 9″ and the BL goes on easily. I have also had access to a larger electric carder that does 4 oz. batts and the BL does not back on as heavily as some other breeds, but the benefit is that you can get away with only carding once or twice for a very smooth batt! 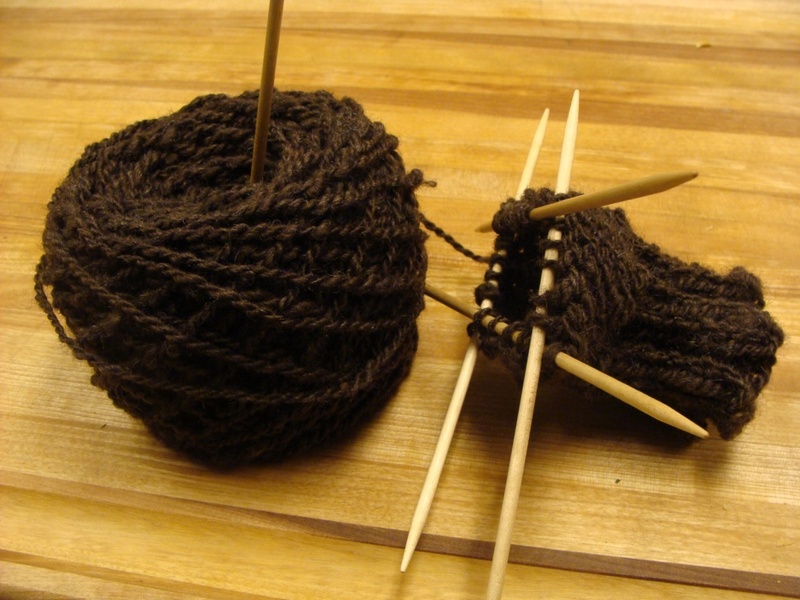 Border Leicester Mittens – also great when felted! 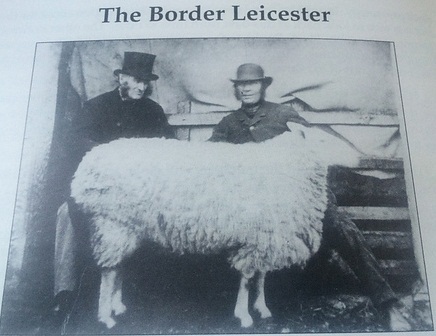 “The Border Leicester is one of the oldest breeds in Britain, made famous by Robert Bakewell of Dishley, Leicestershire (1726-95). Introduced into Northumberland in 1767 by the Brothers Culley who were pupils of Bakewell, these improved Leicesters were soon established on both sides of the border. When these breeders wanted fresh blood they invariably had recourse to Dishley. Are there any differences between 21st century Border Leicesters in the United States and those in the United Kingdom? BL sheep of the UK are much larger than in America. UK BL’s have more erect “rabbit ears” whereas US BL’s ears are a little more relaxed to each side. How does the wool of UK Border Leicesters compare to US Border Leicesters? In general, UK BL wool is closer to Cheviot and US BL wool is closer to English Leicester. 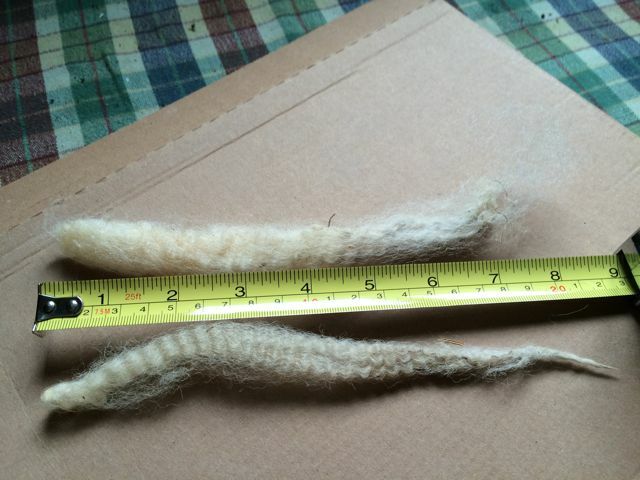 The fibers are similar in length; The American BL is a looser crimp (reminiscent of old fashioned English Border Leicester, perhaps Lincoln or Longwool bloodlines in developing years) and the UK BL has a tighter crimp (more Cheviot blood in development years). The wool spins up similarly, the UK wool is a little softer & springy than the American.